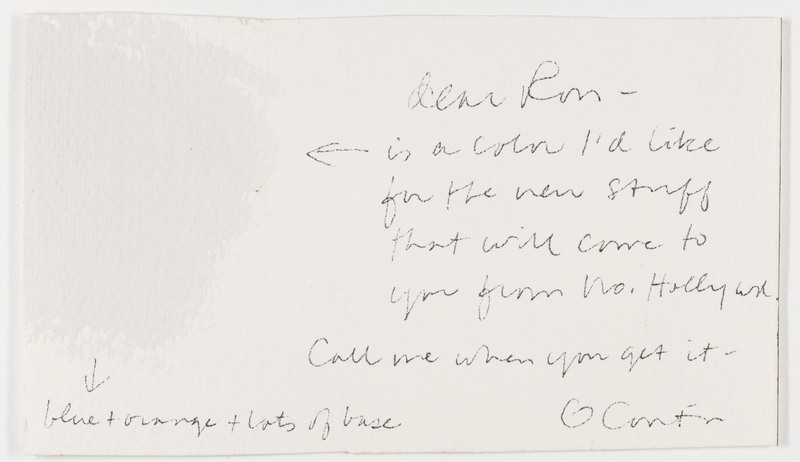 Inscriptions: r. handwritten in ink: "dear [sic] Ron- / is a color I'd like for the new stuff that will come to you from no. Hollywd. [sic] Call me when you get it - / Corita"; l.l. handwritten in ink: "blue + orange + lots of base"; verso, l.l. handwritten in pencil: " 473 / 617 / 437 / 1877"
"Untitled." Corita Kent in the Grunwald Center Collection. Los Angeles: Hammer Museum, 2017. https://​hammer.ucla.edu/​collections/​grunwald-center-collection/​corita-kent/​art/​untitled-preparatory-materials-for-el-salvador-is-all-of-us-b/​.